How has your past prepared you for your future? We are all the sum of our past experiences. The skills and abilities you have today are the result of the cumulative personal, educational and professional experiences you have had, among other things. Our pasts can also create biases, blindspots and areas of weakness that we need to be aware of and/or address to be successful. Many successful people are known for being action-oriented, forward-looking and driven. A skill that most successful people have that may not be as well recognized is a clear understanding of who they are and the path they’ve taken to get to where they are currently. To be successful for the long haul, understanding our past and its impact on our future is an essential ability. 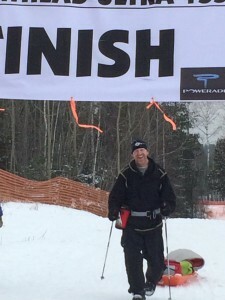 I decided to attempt the Arrowhead 135, a winter ultra-marathon, many years before I actually signed up. I knew it was something I wanted to achieve, but I had a good sense that my endurance, knowledge of winter travel and winter survival skills were not adequate for the challenge. I knew that my past experience, though it included numerous endurance events, significant winter travel, and comfort in the outdoors in all seasons, was just not adequate. It was not until I moved to northern Minnesota and learned to be comfortable day and night in extreme colds that I felt confident enough to sign up. I also planned my training to address deficiencies that I knew existed in my skill set and gave me time to test new gear and systems in the environment in which they–and I–would be tested. Even after all of that it took me two attempts to reach the finish line, on foot, in what’s been called one of the 10 toughest races in the world. Many competitors from around the world with less winter experience have attempted the race. Some have been successful, but numerous competitors have suffered significant frostbite, and have been faced with nearly life-threatening situations. Before taking on a new challenge, or before trying to solve a significant challenge that’s been thrust upon you, it may be worthwhile to do some reflection on how your past experiences–and other influencing factors–have prepared you to be successful. –Have their been similar challenges you’ve faced? –What lessons did you learn from those challenges that may be applicable to this situation? –What successes or failures have you had that have helped shape who you are at this moment? –What people from your past (or the lessons they taught you) might you call on to support your effort? –What deficiencies, biases or blindspots need to be acknowledged and addressed for you to be successful? This concept comes from Endurance Leadership program. Visit our website to learn more about how we can engage your group around this and other important leadership lesson.